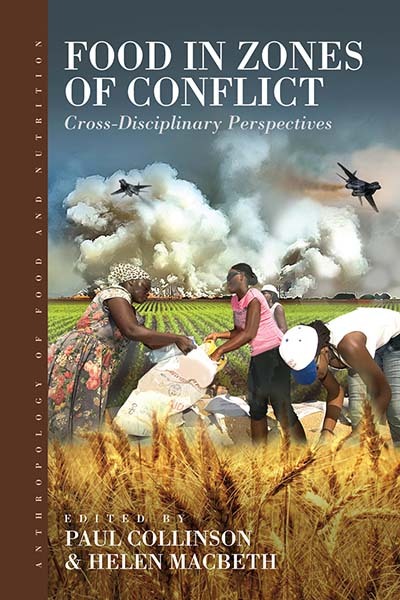 Food in Zones of Conflict is a multi-disciplinary volume on global studies in food and conflict consisting of sixteen chapters that each present a unique perspective on the issue. Covering a wide range of geographic areas, including sub-Saharan Africa, Sri Lanka, Sierra Leone, Croatia, Mexico, and Ethiopia, Food in Zones of Conflict emphasizes the need to examine inequalities and inequities in access to food, especially in times of conflict. Addressing concerns that seem all the more relevant in today’s political climate, the chapters demonstrate how food insecurity and conflict are often intertwined, with conflict causing food insecurity and food insecurity causing conflict, thereby creating a cyclical epidemic in these zones of conflict. The emphasis of this cycle also serves to illustrate the political significance of food, both as a means of social control and as an impetus for inciting rebellions and riots. Rusca’s chapter exemplifies this, utilizing examples from a post-World War I Weimar Republic, where famine was used both as a means to bring the Germans to heel after their involvement in the war, and as propaganda allowing the National Socialists to rise to power. Food insecurity and conflict often also contribute to syndemic conditions, including trauma, disease, and poverty, as illustrated by a number of authors in this volume. Of course, as Shepler noted, these syndemic conditions often impact those who are of lower socioeconomic status, as the individuals who are fortunate enough to have fewer inequities are more likely to have the resources to eat better during times of conflict. Meanwhile, as Adeyemi Oyeniyi and Akinyoade demonstrated, these syndemic conditions are most likely going to affect those who produce the food for a country, creating a conundrum where these food producers and farmers cannot access the food they are growing, either because of physical barriers from the conflict or economic barriers due to their social class. It should be noted that removing individuals from these zones of conflict does not necessarily mean that food insecurity comes to an end, as Henry and Macbeth so aptly articulate in their chapter on nutritional concerns facing those who reside in refugee camps. In her chapter on household food consumption in Sri Lanka, Kent provides an alternative measure to the USDA Household Food Security Survey Module. Instead of relying on the USDA measure, Kent sorted households into categories based on household consumption patterns that also took seasonal patterns of food shortage into account, thereby allowing for Kent to adequately assess if households dealt with food insecurity on a daily basis or only seasonally. Kimaro, on the other hand, utilized the three pillars of food insecurity—availability, access, and use—to ascertain the role that religion may play in the search for food security in sub-Saharan Africa. Finally, several chapters explore the complexity of identity and food in conflict, with Cwiertka discussing the implications of globalization as soldiers on the Pacific Front received provision packages during World War II. Meanwhile Campbell provided a more personal story, discussing the identity crisis faced by American soldiers deployed in Iraq who often had to choose between eating MREs, going hungry, or willingly consuming “the enemy’s” food. Yet while Collinson and Macbeth did an excellent job of compiling a wide range of studies in food and conflict, it is worth noting that a number of the studies take a historical approach, especially those that discuss food issues during WWI and WWII. That said, these case studies, while dated, contribute to the existing literature and provide potential frameworks for other studies to utilize in their examination of food and conflict. Given this, it should be noted that many of the case studies in this volume could benefit from the application of a more applied approach, or at least an examination of how these examples from the past can contribute to contemporary issues of food in zones of conflict today. This lack of an applied approach is felt especially when the chapters are examined in the larger context of conflict today, with refugee crises in Syria, South Sudan, Afghanistan, Somalia, and Myanmar. Furthermore, given the conflicts in the United States with regards to immigrants, detention centers, and the increased border patrol presence in the U.S.-Mexico border region, an applied approach that speaks to current instabilities seems all the more relevant today. Finally, Food in Zones of Conflict could benefit from additional theoretical and methodological grounding. As it is written, the volume serves as a “taste test,” allowing the reader to skim the surface of a number of issues that arise in areas of conflict, from food insecurity to human rights violations to the pervasive use of food as a way to wield power over people. While this approach succeeds in providing the reader with a review of the current literature, it misses an opportunity to contribute to the reader’s theoretical understanding, despite having a multitude of opportunities to interweave contemporary theories. For example, while some chapters touched on the embodied consequences of conflict, the continued shaping of practice and agency surrounding food choices and practices is largely overlooked. Furthermore, given the emphasis on the interconnectedness between food, conflict, and power, it seems strange that theories of power, syndemics, political economy, and structural violence were not further expanded upon in order to strengthen the arguments made by the authors. In sum, despite the seeming lack of theoretical contribution, Food in Zones of Conflict is an excellent read for anyone who is interested in the issue. The broad range of topics, time periods, and geographic locations make the volume approachable to those who are only seeking to gain a grounding in the topic while the focus on food insecurity also makes this volume ideal for any academic seeking to review the current literature. Furthermore, the interdisciplinary perspectives provided by the authors make these case studies relevant to a number of fields, including anthropology, history, sociology, public health, and food policy and planning. Given the accessibility of the volume to a number of audiences, I expect that Collinson and Macbeth’s edited work will influence future food studies in zones of conflict for years to come. Several weeks ago, we posted a link here to a New York Times op-ed by Bonnie Tsui that explored the strange case of “Asian Salad” on restaurant menus as part of a broader reflection on food and racism. It is perhaps not surprising that Tsui’s article generated quite a lot of commentary around the food world, especially the American food world. One of the more interesting set of commentaries on both Tsui’s piece and on the reactions to it can be found here, in a set of brief notes by Tsui, Shakirah Simley, Stephen Satterfield, Dakota Kim, and Tunde Wey. Along with the original salad editorial, this could be a great framework for a discussion in any number of classes. The acquisition of Whole Foods by Amazon has been the talk of the food world since it was announced a few weeks ago. What it may mean for the American food system, for food activists, for the food movement, is hard to determine, but there is no shortage of opinions. For instance, over at Slate, Joshua Clark Davis argues that it signals the demise of Whole Foods’ ability to be seen as a company with a somewhat different approach to capitalism. Derek Thompson analyzes the purchase as a business strategy in the Atlantic. On the NPR food blog, Mollie Simon examines small business owners who work with Whole Foods and finds their reactions surprisingly positive. And in the National Review, Henry I. Miller and Jeff Stier examine the purchase by raising some harsh questions about Whole Foods’ business model and ideology. There are a lot of different ways to try to capture a sense of place through food. Over at “First We Feast” there is a new series of food videos, Food Grails, devoted to exploring the “flavor” of different cities through iconic and somewhat less-well-known foods. These are variations on the kind of food television pioneered by Anthony Bourdain, with a focus on communities not often seen on more mainstream food networks. Miss Info (aka Minya Oh) is the presenter for each of the episodes, which explore Vietnamese Po’boys in New Orleans, mumbo sauce in Washington D.C., Jamaican beef patties in New York, and African-American tacos in South Los Angeles. The Culinary Historians of New York have a journal and that journal has a new issue. You can read it here. Articles by/about Joy Santlofer, Paul Freedman, Charity Robey, and Kian Lam Kho, along with a list of (and links to) recent books by members of the association. The most recent issue of Practicing Anthropology (volume 39, number 3, summer 2017) features research in applied anthropology from graduate students at the University of Maryland. Two of the articles should be of particular interest to our readers. First, Amber Cohen, Noel Lopez, and Katie Geddes reflect on subsistence fishing in rivers in the Washington, D.C., area. Second, Ashley Dam looks at the ways in which elementary school children in Maryland engage with federal nutrition education guidelines. In both of these cases, ethnographic research is used to make the case for particular kinds of social policies. These are both great examples of the kind of research we should be showing people when they want to know whether or not the anthropology of food and nutrition can be useful. Want to buy domestic fruits and vegetables in the United States? There are farmers who grow such things, but they need workers to do that and for a long time many of those workers have been immigrants. As Tom Philpott has documented in Mother Jones, the Trump administration crackdown on undocumented workers has resulted in crops rotting in the fields. You can still get produce…it just has to be imported from Mexico. Meanwhile, the fight for a livable minimum wage continues. Apparently one recent study seemed to suggest that raising the wage to $15 per hour actually hurt workers. But a review of a wider variety of studies by Michelle Chen at the Nation suggests that raising the minimum wage is particularly beneficial for workers in the restaurant industry. In addition, Michael Reich and Jesse Rothstein provide a very useful overview of some of the arguments and data in this debate here. There seems to be a lot of industry interest in innovations in the food world. This may be a way of looking like a good corporate citizen or it might be about finding new products and new markets (or both). Certainly, the broad discourse around innovation, entrepreneurship, social marketing, disrupters, and all that is enough to make one wonder if companies are doing good or just trying to look good (refer back to the acquisition of Whole Foods by Amazon for an example of all of this). So it is with caution that we offer this link to an effort by Swedish furniture giant Ikea to help support startup businesses. They are looking for business ideas that will “challenge known truths in a world of ideas and technology.” Among the big thematic areas they want to disrupt: sustainability and food innovation. Got an idea? They might have resources for you. You are going to want to wash your hands after you read this. It is a piece by Wayne Roberts, on Medium, about the effectiveness of soap and cool water washing of hands for food safety. But more than that, it is about the meaning people often bring to putting hands on food, in preparation as well as in eating. And it is an argument for thinking about food production as practice. Now, go wash your hands. Another set of thought-provoking readings and recommendations from frequent FoodAnthropology contributor Ellen Messer. Note that while many of these are inspired by items from the Financial Times, Dr. Messer has found links to related stories from other sources. This is because access to the Financial Times is restricted for non-subscribers. If you do subscribe to the FT, you can probably find the original articles quite easily on their web site. (1) the Swiss based global trading firm Glencore, which recently underwent reorganization because of its high debt obligations, seeks combination of its Glencore Agriculture unit with Bunge. It aims to break into the “big four” global agricultural trading firms (ADM, Bunge, Cargill, and Louis Dreyfus) at a time when agricultural margins are low because of booming harvests, and as farmers the world over seek leverage to sell directly to buyers, squeezing the big four on profitability. Glencore Ag, which has a major presence in wheat, seeks expansion in the US and South America in soybeans and other commodity crops in which Bunge enjoys comparative advantage. Glencore Ag has the money to do this because the company recently offered a 50% stake in its business that was purchased by two Canadian pension funds, who now, in addition to owning 50% of Glencore Ag also own 50% of its debt, so that the company has raised its potential profitability ratings. Bloomberg news weighs in here, with graphs showing the markets’ reaction. (2) European and North African olive oil production is way down because of drought, and prices for extra virgin olive oil have risen in tandem. This article gives the official reductions in product for Italy, Greece, and Spain (which it says is the largest producer) but does not discuss whether California olive industry is offering more product in response. Nor does it suggest any further dilution in product, which culinary experts say is always a problem in commercial oils. The Olive Oil Times has a series of supporting articles here. (3) Coca Cola is trying to raise the desirability of its brand by emphasizing its “inclusivity” —with reference to its historic claim that everyone, however defined by ethnicity or economic class—can afford to enjoy Coke (citing Andy Warhol’s iconic image and phrase) and its efforts to improve its nutritional profile. The company officially endorses the WHO guidance that added sugars should provide no more than 10 percent of total caloric energy intake. The company claims to be contributing to reductions in sugar intake by reformulations or smaller portion size, both of which potentially reduce added sugar intakes in its products. But the company also has to find new revenue streams to replace lost sales from coolers, which are losing sales especially in locations like shopping malls, which are experiencing lower foot traffic as more people shop on line. The official company statement on “inclusive” culture can be read here. (4) And finally, not really a “food” story but a feel-good sheep textile story, which replaces “farm-to-table” with “sheep-to-shop” traceability and authenticity, as people can watch their clothing being created in iconic textile mills with high skilled artisan labor input that they are willing to pay for. The designer realized that low cost Chinese labor would always outcompete British firms, and came up with this new old idea to compete on quality and local employment. The name of the entrepreneur is James Eden; the town was once known as Cottonopolis. The FT article can be accessed here. US PBS (National Public Television) has some food shows that are worth viewing for their stunning visual presentations of food and food culture, story lines, and possible critique. “A Matter of Taste” “Food—Delicious Science” aired in mid-May 2017. The lessons in the chemistry of taste and food preservation feature British science filmmaker Michael Mosley and ethnobotanist James Wong. For starters, they showed that taste is organized into five flavors, which can be reduced to their purified chemical essences—sweet, bitter, salty, sour, umami. These findings were connected to particular foods, which showed how acidity (sour) can be measured (by pH) that turns out to be pretty constant across fruit categories (watermelon is the least acidic), even though one senses that fruits such as strawberries are more sweet than sour. The reason for this is that aromatics enter into perception of sweetness, but the chemistry of this trickery and its connection to complex flavors was not well communicated. The program would have been more insightful (and more fun!) had it featured U.S. taste psycho-physicist Linda Bartoshuk describing her own experimental findings, which show how volatiles (the aromatics) leverage sweet taste perceptions and complexity. (An engaging interview about her career can be accessed at here. But further surfing on the web reveals that BBC already did a Bartoshuk piece, so maybe what we see here is Mosley, a BBC showmaster, distancing himself from the competition (Veronique Greenwood) and Wong, an ethnobotanist, privileging plants over people (psychology). The other featured foods included traditional Andean freeze-dried potatoes. This segment featured Wong (who spoke Spanish pretty well) visiting a highland Andean community, which grows many varieties of potatoes, and singles out an especially bitter variety for freeze drying into chunyo, a series of steps that take place at an even higher elevation. I did not think that the segment communicated the complexity of the process, which involves multiple days of washing, freezing, stamping out bitter alkaloids. They made the process look simple, and the taste of chunyo look delicious, which is a stretch. Another featured food was Iberian black pig. This segment showed plump pigs nosing out acorns as nourishment, which the narrator informed is what flavors the meat with its extremely delicious umami taste. Although butchering was the theme, the visuals showed limited blood and gore, as an extended family gathering around a festival table to share the annual pig-slaughter and processing ritual, which uses all parts of the animal in some culinary fashion. There were then multiple scenes of multiple people shaving off thin slices of exquisite ham, which they ecstatically sampled. The idea of traditional foods guided by flavor and artisan technologies informed both pig and potato segments; the filmmakers could have made more connections to tomato and strawberries, which are also preserved with value added through artisan technologies. This is the second of three in their series, “Secrets of Food,” which aim to illuminate the biology, chemistry, and physics of the items people eat, although as reviewers emphasize, few Brits (or Americans) will have tasted many of the examples. PBS also has new American Masters shows featuring lives of major chefs and cookbook writers, including Jacques Pepin, Julia Child, James Beard, and Alice Waters. So far, viewing them at night, they’ve put me to sleep, but that may be due more to the knock-out pollen load this spring in Boston and their relatively late viewing hours. For anyone teaching relevant course materials, they should provide opportunities to compare the relative advantages of visual media vs. text for communicating the food and restaurant history in the US. The Alice Waters story, “Delicious Revolution,” uses the metaphor of food politics and performance, which will provide a useful backdrop to my summer graduate seminar: “Local to Global Food Values: Policy, Practice, and Performance”. The 2017 Society for Applied Anthropology meeting (March 28-April 1) in Santa Fe has shaped up to be an incredible showcase of food-related research. In particular, I want to draw your attention to six panels which take place on Tuesday and feature foodways of New Mexico and the Southwest, with topics ranging from markets, food hubs, and community gardens to Native American seed saving and agriculture of the Southwest. If you can’t make it by Tuesday, don’t worry. Thursday and Friday feature a food, agriculture, or fisheries panel during every session. We’d love to highlight the work of SAFN members, so let us know about your sessions and papers. In case we missed your panel or presentation and you’d like your panel or presentation to be included in our PDF, please email Amanda Green at amagreen@gmail.com. We look forward to seeing you in Santa Fe. CHAIR: SPARKS, Kim (PSMFC) SPARKS, Kim and SANTOS, Anna N. (PSMFC), KASPERSKI, Steve (NOAA Fisheries), and HIMES-CORNELL, Amber (U Bretagne Occidentale/NOAA Fisheries) Groundtruthing Social Vulnerability Indices of Alaska Fishing Communities Wednesday, March 29 28 WIXOM, Tarra (UWF) Exploring the Social Impacts of the Red Snapper Individual Fishing Quota (RS-IFQ) Program: Ten Years Later MATERA, Jaime (CSUCI) Assessing the Importance of Artisanal Fisher’s Diversified Livelihoods and Trust of Marine Resource Management Institutions in Providencia and Santa Catalina, Colombia BISWAL, Rajib and JOHNSON, Derek (U Manitoba) The Socioeconomic Dynamics of the Bag Net Fishery on the West Coast of Gujarat, India: From Food Scarcity to Food Security BROWN, Lillian (Indiana U) Where Do Fish Values Come From? CHAIR: FRENCH, Melissa (OR State U) FRENCH, Melissa (OR State U) Cosmovisions and Farming: An Investigation of Conventional and Alternative Farmers’ Environmental Values along the Willamette River. LAFFERTY, Janna (FIU) “Local Food” Assemblages in a Settler Colonial State: Coast Salish Sovereignties, Nature, and Alternative Food Politics in Western Washington DIRA, Samuel (UWF) Cultural Resilience among Chabu Forager-Farmers in Southwestern Ethiopia. Frequent FoodAnthropology book reviewer Ellen Messer has sent us this eclectic collection of comments and insights into recent food and nutrition related news. We hope to be able to publish more commentary from food and nutrition anthropologists on current events and public policy in coming months. Sugary sodas account for 10% of one grocery chain-store food tabs of SNAP beneficiaries, whose receipts show they also buy lower amounts of fruits and vegetables than non-SNAP consumers. Will this convince law makers to dis-allow sugary beverages as SNAP purchases? Or will lawmakers use this as an excuse to cut SNAP benefits so government food-and-nutrition benefits don’t contribute to chronic-disease inducing high consumption of sugars? Nutritionist and food-policy analyst Marion Nestle sounded off against the evil, sugary beverage industry lobbyists, with support from David Ludwig, director of Boston Children’s Hospital’s New Balance Obesity Prevention Center. Another critical voice is Michele Simon, a public-health lawyer, who railed against government (and taxpayer) subsidized sugar and diet-related disease. In the past, surprising voices against restrictions have included the Food Research and Action Center, which resists any policy change that might stigmatize low-income SNAP beneficiaries. Perhaps they are also thinking that stigma might resonate with those who want to cut SNAP benefits—period. Do those who analyze food purchases and dietary intakes have the right methodologies? Should sugar intakes be restricted for everyone? If so, how? Gary Taubes, a food writer whose earlier book demonizing nutritionists as a large part of the problem of establishing fat over sugar as the culprit, has spent an additional four years trying to understand the science behind sugar’s debilitating impacts (see Chef/Sustainable Food Advocate Dan Barber’s NYTimes review). Taube’s basic contextual arguments are as follows: Since the 1960s, obesity, diabetes, and other chronic disease have become worldwide epidemics. He thinks surging intakes of refined sugar, a category that includes cane, beet, and high-fructose corn sugar, is the cause. His research traces increasing intakes everywhere. In the US, big intakes of sugar followed the earliest Surgeon General’s report and associated Dietary Guidelines advising Americans to eat less fat, especially saturated (animal) fats. The food industry happily complied, by reformulating products that contained less fat, especially saturated fat, but contained more sugar. To substantiate the science, Taubes zeros in on the different ways the body metabolizes different sugars. The arguments, and a continuing diatribe against professional nutritionists who insist that calories do count, and that sugar alone can’t be blamed, so aid and abet the sugar industry, can be accessed here. There is also a badly edited, earlier video that features Taubes with Tufts Nutrition Dean Mozaffarian, available here. Although Taubes accepts the nutritional wisdom that individuals and populations differ genetically on their capacities to metabolize foods and their nutritional components, he favors a tobacco analogy that asserts there is no safe level of refined sugar intake. The biological key to understanding why sugar is so toxic concerns its metabolism and impact on insulin function, the pancreas and liver, and resulting skewing of energy use and fat storage in all foods. This biochemical process is still incompletely understood, and may involve not only sugar’s direct impact on human biology but also the consequences of not eating certain foods that protect against sugar’s harmful effects. As a former chain smoker, who has weaned himself off tobacco but for years used nicotine patches to dull the craving, he favors complete elimination of sugar; i.e. “no safe level” although he recognizes this is unrealistic given that sugar is an ingredient in most foods. (This was one place where his culinary knowledge was faulty, because sugar not only contributes “sweetness” but also binds other flavors together, which is why it appears in recipes for sauces and stews. Before sugar production and processing became part of the colonial Triangular Trade, it was a valuable spice that was used sparingly like other relatively expensive spices.) He also demonstrated an unwillingness to think more completely or complexly about the combinations of sugar plus other foods that might be skewing nutrient utilization. Other likely contributing factors are separated vegetable fats that enter the food stream at greater scale during the same period, after the 1960s, when overweight up-ticks dangerously along with chronic disease. Other possibilities are more hormones or chemical additives or unintentional toxins in animal products. In general terms, he does wonder whether there is something missing in the diet that might have been protective, including fats of various types. This dietary gap is intrinsic to Tufts Nutrition Dean Dariush Mozaffarian ’s argument that the epidemiological data does not rule out high consumption of sugar, as opposed to fat, as a risk factor for heart and other chronic diseases. Taubes’ response is that sugar is the common denominator everywhere, but especially sugary beverages. These other foods are not necessarily present or part of the epidemiological picture everywhere in the world. But I wonder, as I think not only of sugar and alcohol, but fry bread that is part of Native American foods, and all the hush puppies and other fried foods that are typical in African American diets. I sense nutrition shares with agricultural sciences the dilemma that existing methodologies do not allow researchers to ask more complex questions about diet. The equations handle one or at most two or a few dietary factors at a time. In dietary studies, researchers also aggregate primary and secondary foods in what may be unhelpful ways. Thus, USDA researchers, analyzing SNAP vs. non-SNAP food-purchase data from the receipts of a major food chain, find that SNAP recipients, in aggregate, purchase soft drinks as 10% of their food expenses. This does not count the beverages purchased at corner convenience stores or prepared food venues. The rest of the tallies reveal 80 percent of the tabs go for primary (40%) and secondary (40%) food staples, two categories that overlap in that “milk” is counted as a primary staple but “dairy” is a secondary staple. Legumes overlap primary and secondary. Nutritionists such as Marion Nestle champion reduction and preferably elimination of sugary beverages in diets. This is not going to happen, but what could change? How might nutritionists adjust their methods (“cluster analysis”) to take into account fuller dietary patterns? Meanwhile, laboratories in the US, Europe, and elsewhere are trying to reduce (red) meat consumption for any number of environmental, ideological, or political reasons. Laboratory efforts to mimic beef burgers with microbial ingredients has become a growth industry for food chemists and sensory experts and food-studies (especially social and cultural studies in the history of science and technology) researchers who track and compare the motivations, terms of analysis, and sensory and economic results of such lab-meat efforts. The latest entry concerns “Impossible Burgers” which contain a clone of “heme” iron, which is what gives meat burgers their flavor. The article also includes a video, which makes the burgers seem (to me) quite unappealing. Sensory analysts are also busy developing more flavorful berries. An engaging professional profile describes the passionate expertise of one Driscoll employee, who applies the lessons learned in his UC Davis undergraduate concentration Nutrition, and two master’s degrees; one in nutrition biology, a second in food science and technology. Go back a week to food-writer Corby Kummer’s review of three recent books on the history of U.S. food culture. It suggests that the overall theme in American food history is to welcome immigrants. On evolved or un-evolved behaviors, check the January 16, 2017 science and culture reflections by an NPR correspondent, who cites interpretations of Donald Trump’s character by primatologists and ethnographers of foragers. These traits are consistent with non-human and human primates asserting dominance, like a would-be alpha male (chimp) leading his troop, or a forager bragging about his success as a hunter bringing down prey. Anthropologists from around the world gathered last week at the Society for Applied Anthropology (SfAA) Annual Meeting in Vancouver, B.C. Dr. Colin Thor West (UNC – Chapel Hill) organized a two part session and roundtable titled ” Rural Livelihoods and Food Security: Ground-Truthing Global Progress.” Global assessments by the UN, FAO, WFP and other international agencies indicate we are making substantial progress toward eradicating hunger worldwide. Participants in this session discussed these positive trends but grounded them in empirical case studies. Collectively, members of the panel emphasized that on-the-ground empirical fieldwork is vital for contextualizing this global progress. Below are some highlights from the papers. Sub-Saharan Africa remains a region where hunger and food insecurity persist. Participatory ethnographic fieldwork among Mossi rural producers in northern Burkina Faso revealed a general sense of optimism that “famines of the past could never happen again.” West used a variety of secondary data to test this perception and see whether food insecurity has decreased and how this compares with other parts of the country. Using GIS, Famine Early Warning System (FEWS) monthly reports, and USAID Demographic and Health Survey (DHS) data, his team assembled a time series of food insecurity indicators. These data allowed them to detect spatial patterns and temporal trends in food insecurity from roughly 2000 to 2010. In one example, they found that the prevalence of childhood stunting decreased across all regions of Burkina Faso between 2003 and 2010 (see Figure 1), but that the northern Sahel Region remains an area where stunting rates exceed 45%. Black Sigatoka disease is a fungal disease that affects banana plants all around the world. Drs. O’Connell and Foster investigate the implications of this hazard for communities in St. Lucia, a Caribbean island heavily dependent on banana exports, and Buhaya, Tanzania where bananas are an important cash and subsistence crop. In both areas, farmers are becoming increasingly threatened by this fungus as climate change creates warmer and wetter conditions that favor its spread. O’Connell’s fieldwork in St. Lucia documented how climate change and natural hazards interact to quickly turn the lingering threat of Black Sikatoka into a catastrophe (see Figure 2). St. Lucia was hit by Hurricane Tomas in 2010. The fungus was once isolated to a small area but torrential rains, landslides, and wind spread it throughout the entire island. The disease devastated banana farms throughout St. Lucia, but O’Connell’s fieldwork showed that some communities recovered more quickly than others. Communities that rely on communal family lands were less financially vulnerable and able to manage the disease outbreak more easily than those who owned their land privately and owed mortgage and loan payments. Family lands were also less susceptible to the fungal pathogen because these irregular shaped fields have natural vegetation buffers surrounding them that limit windblown spores from reaching the banana plants. In contrast, privately owned lands are surveyed blocks of regular polygons that adjoin one another and contain few or no buffers exposing them to more intense infection. Thus, the people farming family land are financially and environmentally more resilient and food secure to this double threat from agricultural disease and climate change. Other panelists presented research on efforts to reduce food insecurity in Alaska, North-East Brazil, Mali, East Africa, and Idaho. They include: Dr. Don Nelson (UGa), Jim Magdanz (UAF), Dr. Lisa Meierotta (Boise State), Dr. Tara Deubel and Micah Boyer (USF), Dr. Kathy Galvin (CSU), and Dr. Philip Loring (U Sask). Dr. J. Terrence McCabe (CU Boulder) and Dr. Timothy J. Finan (UofA) additionally participated along with the audience in the round table. The Society for Applied Anthropology meetings included a very large number of papers on food. Most of them concerned either food security or nutrition programs (often relating to obesity). There were many papers about alternative agricultures, from organic to local and traditional; all such papers supported the local and small-scale as more productive and/or better designed for local conditions than agroindustrial cultivation. Many papers concerned Native American groups—called First Nations in Canada—and the need to revive or maintain traditional foodways as an alternative to diets high in processed carbohydrates. We had many First Nations elders and even more students from Indigenous backgrounds. I went mostly to fisheries papers—SfAA has always had a major focus on fisheries. I started in that area, switching to agriculture and forestry and food history when I found myself teaching at a university in the desert (no fish!). But I get homesick for fish papers, and always go to those at SfAA. Of course fisheries are all about food. Our own Sol Katz (charter member of CNA, now SAFN) presented a session, with a biologist, on saving genetic resources from marine life. In other sessions, I learned that oysters in Chesapeake Bay have declined 99% under Anglo-American pressure after being maintained for millennia by Native Americans in spite of heavy harvesting. I heard a lot about herring on the Northwest Coast, once a major food resource (locally a staple, or even THE staple), now almost gone. They are processed for roe, which often involves taking the biggest female fish and taking them out of the reproductive pool. First Nations people say these larger herring are necessary because they lead the smaller ones and teach them where to go to feed and spawn; there is now much evidence that this is the case. Salmon are of course the famous Northwest Coast food item, and we heard a lot about those—Steve Langdon reported from Alaska that the Tlingit did a great deal of careful, meticulous stream management, under the direction of elders designated as stream guardians. Salmon were stocked, and re-stocked after events like landslides. Moving away from salmon, there was a wonderful paper on wild rice among the Anishinabe by a student who is herself a Komi, a reindeer herding minority group (related to Finns) from far north European Russia. And another excellent student paper concerned food taboos in the Upper Amazon, where animals are humans when people aren’t watching them and thus one is always in some sense cannibalistic—this does not inhibit eating most animals, however, since they are in their animal form when being human food. Applied anthropology is doing very well, and devoted to food among other good causes.